Croplands Equipment specialises in a diverse range of chemical spraying equipment for agricultural farms and vineyards. With the RoGator self-propelled boomsprayer, Dave has a totally integrated machine that not only is safer and far smoother across bumpy paddocks, but also provides him with productivity he could only dream about in the early days. 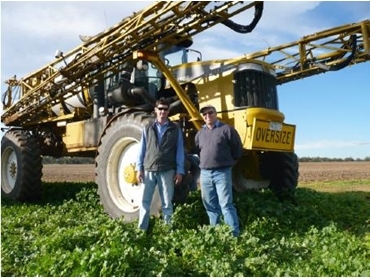 “Before the 1286C I had a 24m Hayes and Baguley spray rig mounted on a Canter truck. I also have a CVX tractor with a Hayes and Baguley trailing boom, which was 33m and in good going I could get about 45ha an hour done,” Dave said. “I’ve gone back to a 24m boom with the 1286C sprayer and I’m achieving 50ha an hour in good conditions with the ability to go faster. Dave opted for the 24m boom because he mainly contracts to the Clyde Agricultural Group working in the Coonamble district. “They farm on tramlines on a 40-80 combination so it was easy for me to just use the 80-foot boom,” Dave said. With an annual program of more than 24,000ha Dave has quickly chalked up 530 hours in the RoGator self-propelled boomsprayer spraying about 12,000ha. “With other work on top of what I do for the Clyde Group, I’m hoping to nudge 30,000ha this year,” he said. Those figures reflect the reason Dave chose a 1286C. Dave also has little to worry about in wet conditions with the RoGator self-propelled boomsprayer providing good traction via hydrostatically-driven wheels. Sampo radial piston wheel motors are directly mounted to all four corners offering full-time 4-wheel drive with the Sauer Danfoss hydrostat transmission driving the wheel motors in an X pattern. This ensures that if one wheel breaks traction, at least two are still driving. A 6-speed range transmission allows multiple on-the-go gear selection to match operating speed and again reflects the advances in technology design. The 1286C employs a front-mounted 8.8L Caterpillar C9 electronically-controlled engine with 232kW engine power rising to 251kW with an eight per cent power bulge. Pressure-compensated hydraulics also reduce horsepower requirements, which in turn reduces oil heating and strain while the liquid system product pump has dedicated hydraulics, so steering or boom functions don’t affect the liquid pump output. To add to reliability and performance, the 1286C sprayer is equipped with a 227-litre hydraulic reservoir to ensure there is plenty of oil in the system allowing it to be properly cooled and filtered to maintain peak performance.